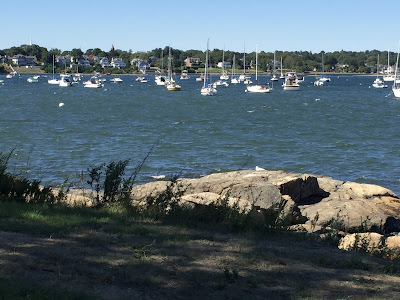 Yesterday I posted a photo that I took last week from Salem Willows, looking at sailboats and the Beverly shore beyond. Here is a version of the same photo with a mosaic effect that I added, using my new Prisma app. I am trying to learn what the various filters do, and most of them allow you to control the amount of effect applied. I also re-cropped the image. I do a lot of art work with digital tools, so I am used to applying various effects and filters, with Painter on my desktop and Brushes on my iPad. 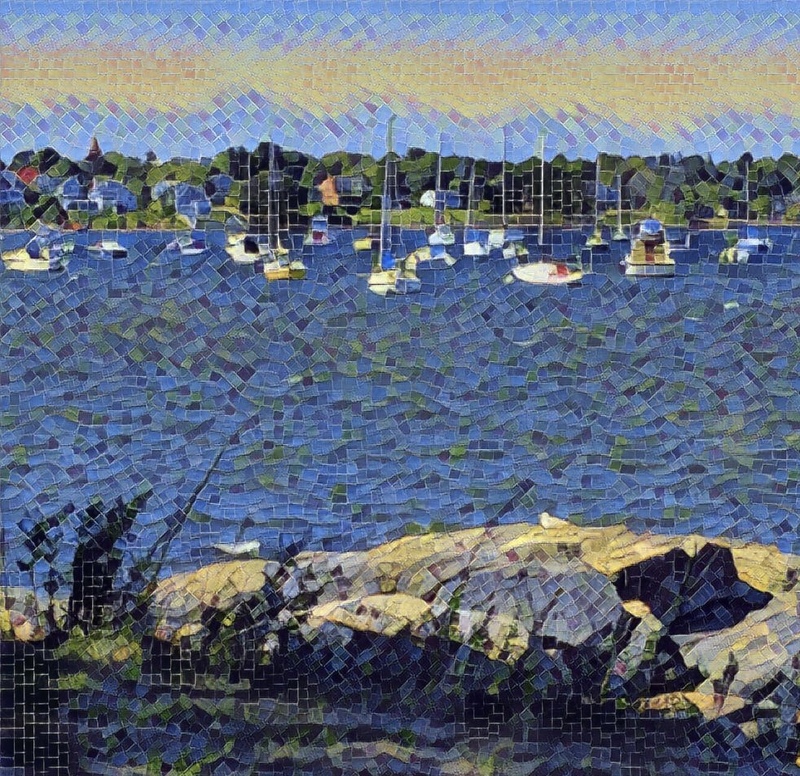 (For example, Painter offers a mosaic effect.) Some people think that this sort of digital tool makes art "automatically" or somehow devalues fine art. I say that thinking Prisma or anything else can make "instant art" is what devalues art. To me, Prisma is just another of the digital tools I use from time to time, and those tools don't devalue what I do when I use oils or watercolors or chalk. Prisma can no more make art "automatically" than a color wheel or a compass or a box of crayons or Photoshop or Painter. It takes the artists' eye, heart, vision, and brain and a thousand tiny decisions to make art, even with the help of a digital tool. 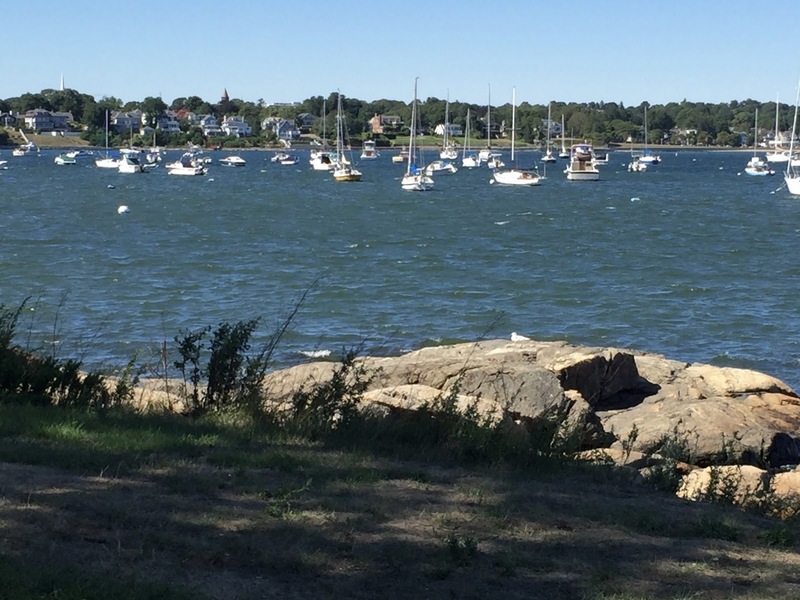 I took this picture last week during a little excursion to Salem Willows. This is looking across the water towards Beverly, Massachusetts. It was very windy but the water was a beautiful color and there were lots is sailboats on the water. Today I cropped the original photo to get this composition. 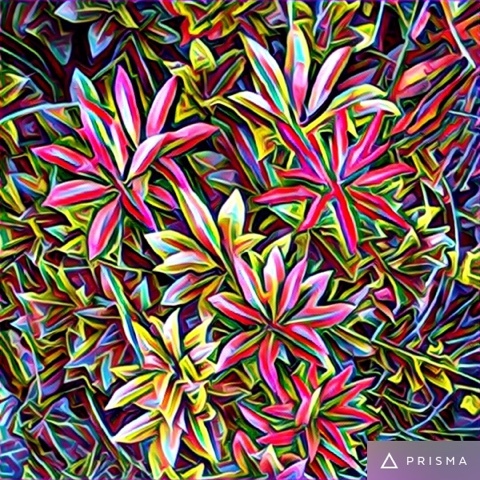 I also used the Prisma app to apply a mosaic effect, and I plan to post the results here tomorrow. This is the second painting I framed over the weekend. It's another mountain landscape painted from my imagination but inspired by memories of the Rocky Mountains in my home state of Colorado. This is acrylic paint used as water media, on watercolor paper (9" x 12"). Yesterday I delivered it to Galatea Fine Arts (galateafineart.com) where it will be on display in September, in the "Artists' Alcove." PS. If you look closely, you can see that this is also a portrait of the artist, reflected in the glass. This image began with an old photograph of my father that I came across the other day. It shows him as a young man. Although the photo is undated, I think he looks to be around 16 or 18 years old. In any case, I loved the photo, but it needed a bit of a rescue. One corner was bent and there were scratches and even ink marks on the face and the color. In addition, it was hard to see the hat because there was nearly no contrast with the background. So I did some basic retouching and then opened the image in Painter. I got rid of the pen marks with some digital pastel, and did some color overlay to clean up the color. Then I lightened the background just a bit so that the outline of the hat became easier to see. Then I did some selective posterizing till I had the effect I wanted. The last step was to crop the photo so that the image was centered. It's nice to see my dad as a young man. It's the same smile as always, and he sure did look good in a hat! I am posting this today to remember my dad on his birthday. 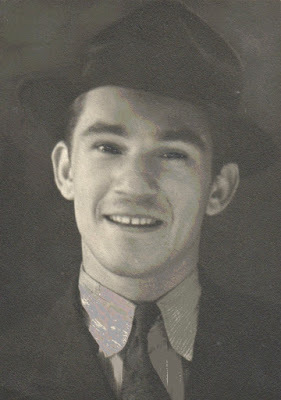 He was born on August 28, 1918, so if he were still around, he would be 98 years old today, and no doubt, he would still be smiling. This morning I framed two recent paintings. 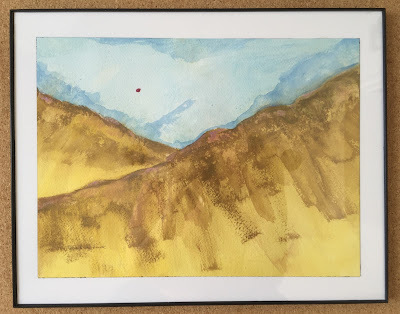 I painted this landscape from my imagination, but it was also inspired by my memories of the mountains in my home state of Colorado. This is acrylic paint used as water media, on watercolor paper. The painting is 9" x 12". This morning I finished the painting I started two days ago. 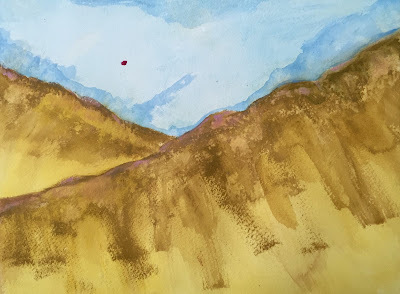 This is a small (9 x 12 inch) mountain landscape painted from imagination and memories of the Colorado Rockies. (I call these paintings "Mountain Daydreams.) 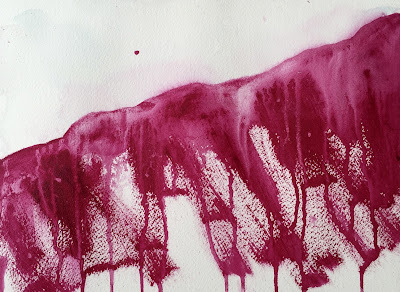 I am working with acrylic paint, used with water on watercolor paper. 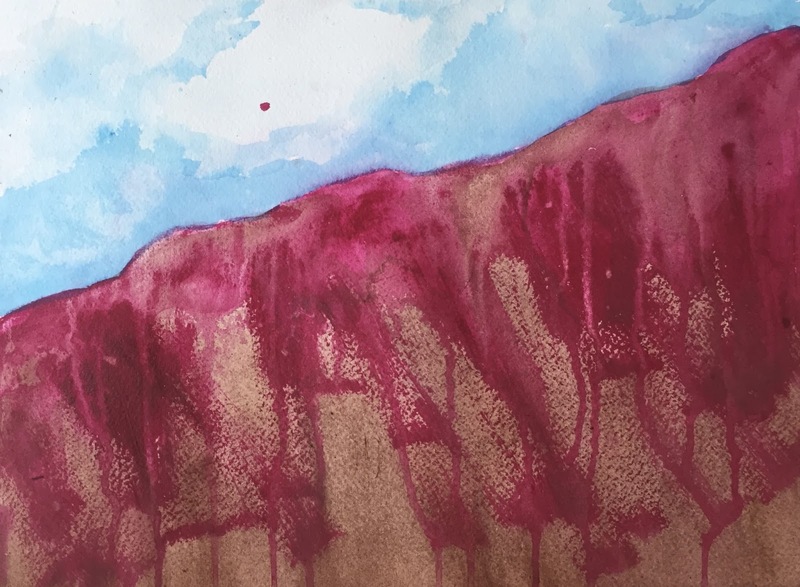 This morning I added some layers of transparent red-violet (the color I started with), to bring up the saturation of color on the mountains. This is the painting I started yesterday, a small landscape. This is one of my "Mountain Daydreams," painted from my imagination but inspired by memories of the mountains in Colorado, my home state. This little painting is 9" x 12", done with acrylics with water on watercolor paper. Today I worked on the sky, adding a couple of layers of blue to suggest clouds. 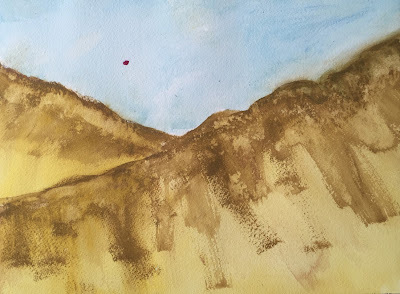 Then I put some brown and taupe washes on the mountain, to suggest depth. Tomorrow I am thinking about following up with a wash in the original ruby color. I started another mountain landscape this morning. This is going to be another of my "Mountain Daydreams" series, paintings done from my imagination but inspired by memories of the Colorado Rockies. I am using acrylic paint as water media paint, on watercolor paper (in this case, 9" x 12"). This is as far as I got with this painting today because I used a lot of water on it and I had to stop so it could dry before I continue. I love the mountains best when the sunrise or sunset makes them look pink. 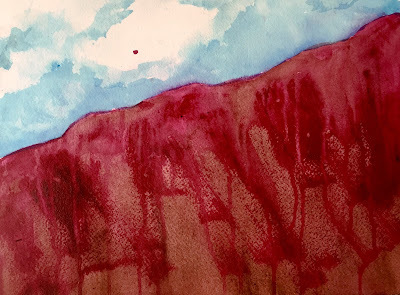 Painting today, I realized that my first view of the mountains is often through tears. I started this painting yesterday, and finished it this morning. 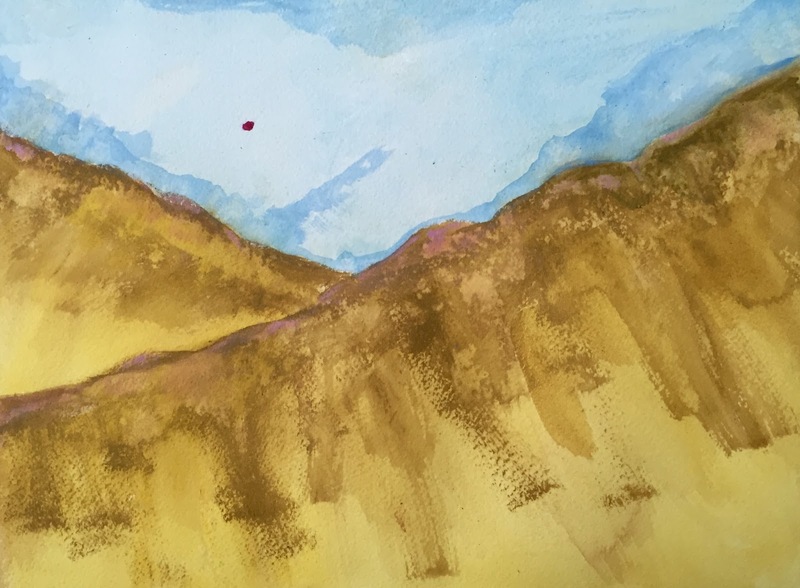 I added a yellow wash to the mountains to brighten the color. Then I added some periwinkle blue areas to the sky, to define the lines of the mountains and to suggest clouds. 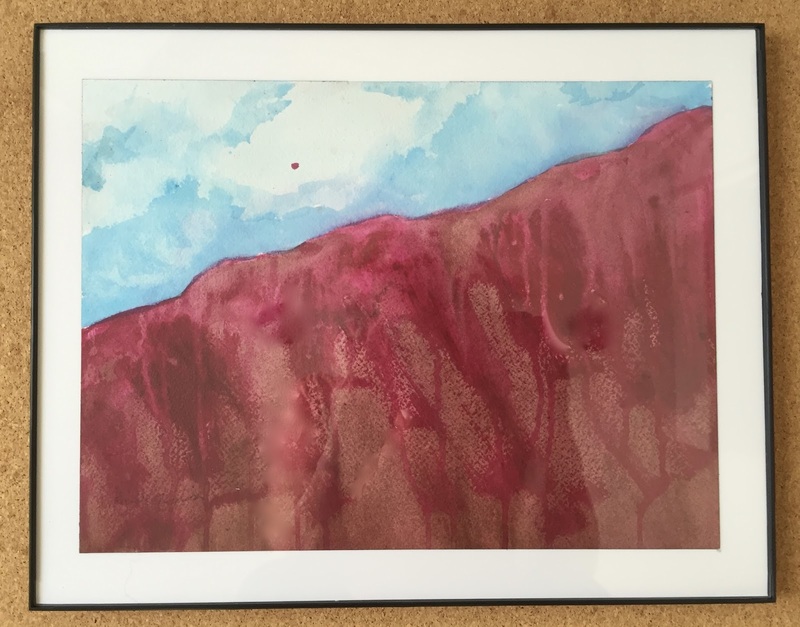 Then I added a few touches of pink on the tops of the mountains. Now I think this is done. 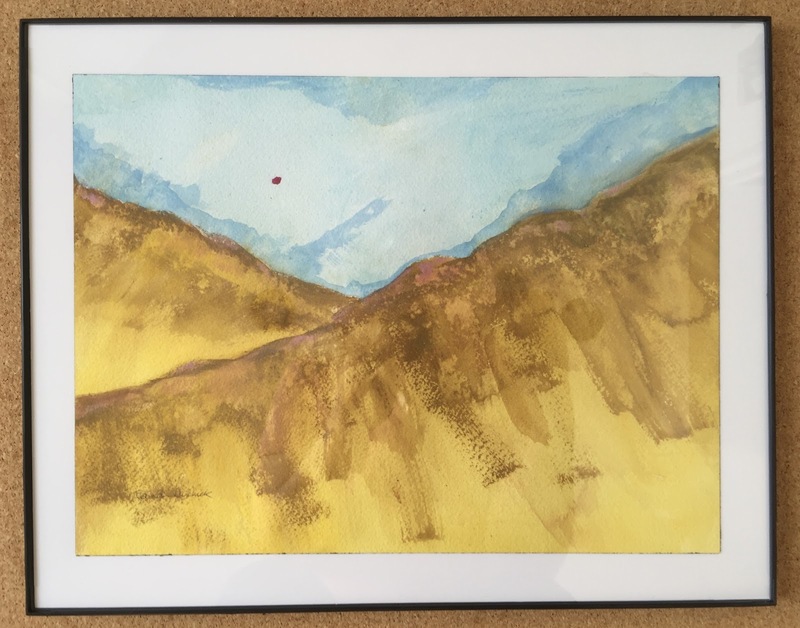 This is one of my "Mountain Daydreams," a series of landscapes painted from my imagination but inspired by memories of the mountains of Colorado. This is done with acrylic paint used as water media, on paper, in this case 9" x 12". I got a new painting started this morning. This is another one of my "mountain daydreams," landscapes from my imagination but inspired by memories of Colorado, where I grew up. I am headed out there in a few weeks, hence the title. This is acrylic paint used with water on watercolor paper. This is a small painting, 9" x 12". This is as far as I got today. I hope to finish it tomorrow. 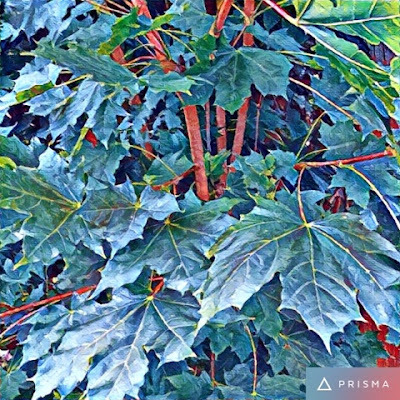 Here is another experiment with the Prisma app that I downloaded recently. I took a simple closeup photo of some maple leaves during an evening walk tonight. Then I cropped it and applied the "Caribbean" filter at 100%. I like the result, so here it is. Two days ago, I posted a photo that I took back in June, some sugar snap peas, still on the vine. 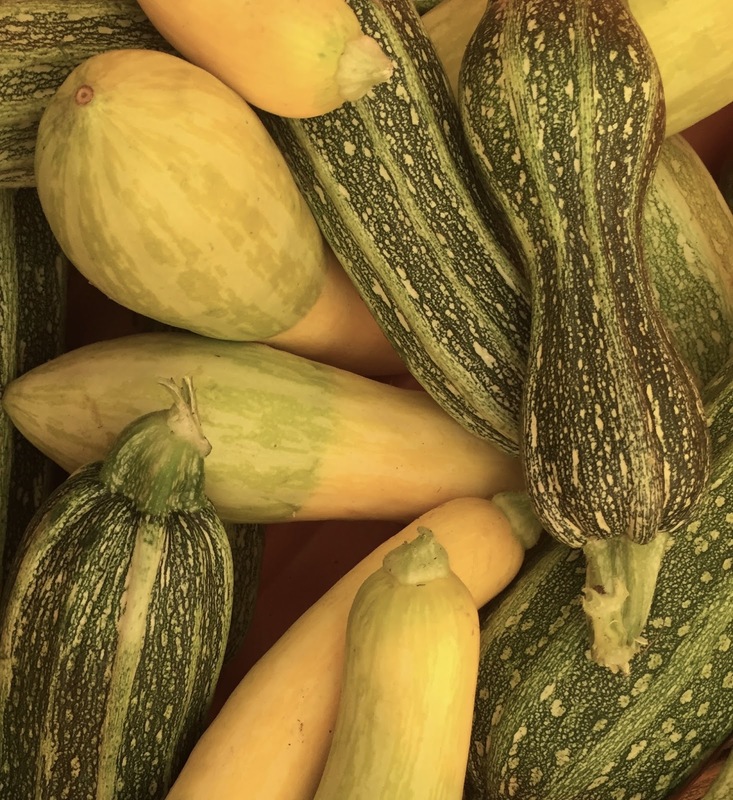 (I was out in the field, picking some of them, as part of our CSA farmshare.) 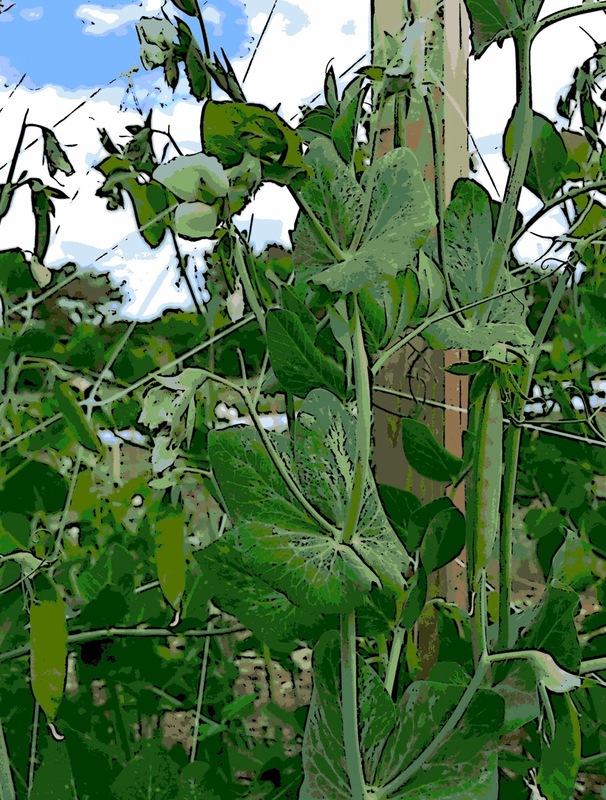 I thought the pea plants were beautiful, so I took some pictures. Last night, I used Painter to turn this image into a digital woodcut. I fiddled with the controls until I arrived at the amount of black outline that I wanted. I wanted to emphasize the lines in the fence, the lines of the tendrils, and the lines in the leaves. Yesterday I posted a photo of sugar snap peas, taken in late June. I was out in the field, picking snap peas at The Food Project (our CSA). But I was distracted by the lovely lines and textures of the tendrils, so I took a picture. Tonight I used Painter to clean up some of the blossoms and then create a posterized version of the image. I also created a digital woodcut version, which I plan to post here tomorrow. I have been posting some of the photos that I have taken when we go to pick up our farmshare from The Food Project. (The Food Project is Community Supported Agriculture or CSA and our pick-up location is Long Hill Gardens.) Sometimes we actually get to go into the field and pick some of the vegetables. I took this photo back on June 23, when I was out picking snap peas. Today I edited the original and cropped it to get this composition. Yesterday's post was an image of eggplant, cropped from a photo that I took a few weeks ago during farmshare pickup at our CSA. Tonight I edited the image in Painter, doing a bit of cleanup with digital pastel, and adding posterizing effect. Here's another image from my little photo shoot a few weeks ago. We were picking up our farmshare from our CSA (The Food Project, at Longhill Gardens.) 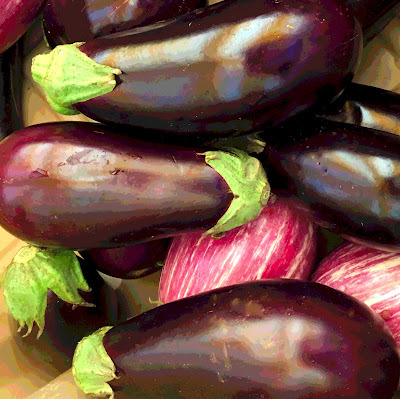 I always love to look at the vegetables, and this time I took some pictures. Tonight I cropped the original photo to get this composition. Yesterday's post was a photo of summer squash that I took a few weeks ago, while we were picking up our farmshare at our local CSA. I liked the composition, but the image still needed a little help, so I opened it in Painter. The color had gone a bit too orange somehow, so I used Painter to improve the color. I fixed a few little distractions with some digital pastel, and then I applied the posterizing effect. Now I like this squash much better. We belong to a CSA* called The Food Project. Once a week we pick up our farmshare, which in our case, is held at Long Hill Gardens. Sometimes its raining and sometimes its too hot and sometimes time is short, but when I get a chance, I like to take pictures. This image started with a photo that I took on August 4, a view looking down into a big tub of summer squash. Tonight I edited the original photo to get this composition. One more image from my photo shoot on July 22, heading into Boston. I was in the passenger's seat, trying to get a good shot of the bridge. But the truck was in my way. So I rolled down the window, held my iPhone outside the car just a bit, and made the truck part of the picture, lettering and all. 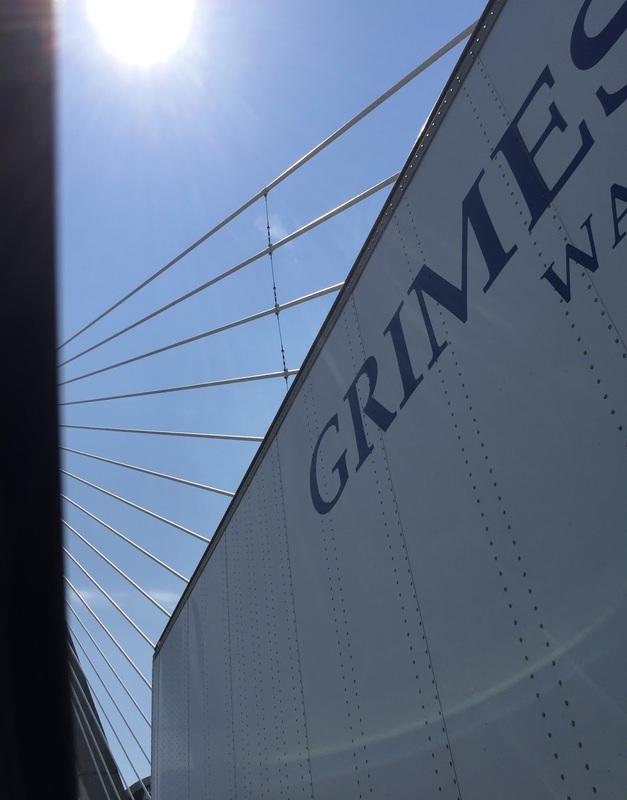 Here's another image from July 22, heading over the Zakim Bridge. I was in the passenger's seat, trying to get a clear view. Tonight I cropped this out of the original photo. 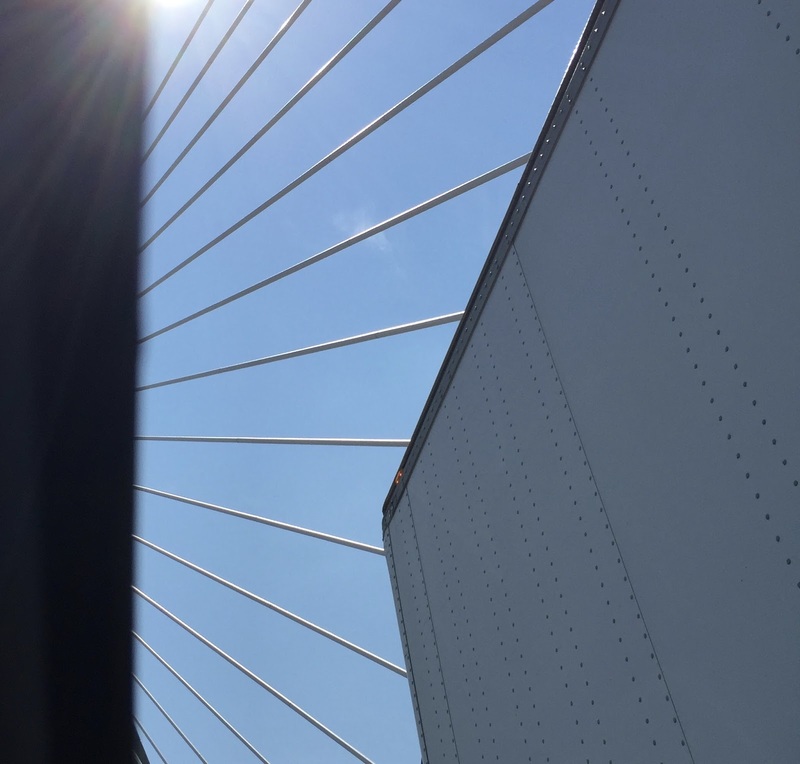 At first I was bothered by marks caused by the sunlight on the windshield, but it makes for an interesting interplay of textures: the geometric patterns of the bridge, and the random patterns caused by sun and glass. 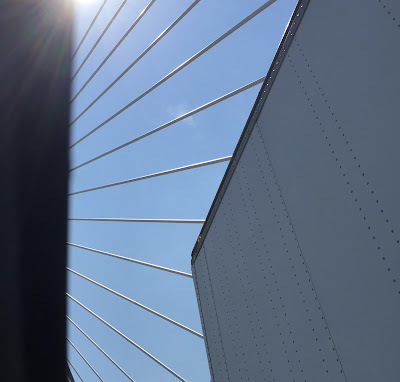 Here's a photo from another set of pictures that I took on July 22, on the way into Boston to meet up with my cousins. 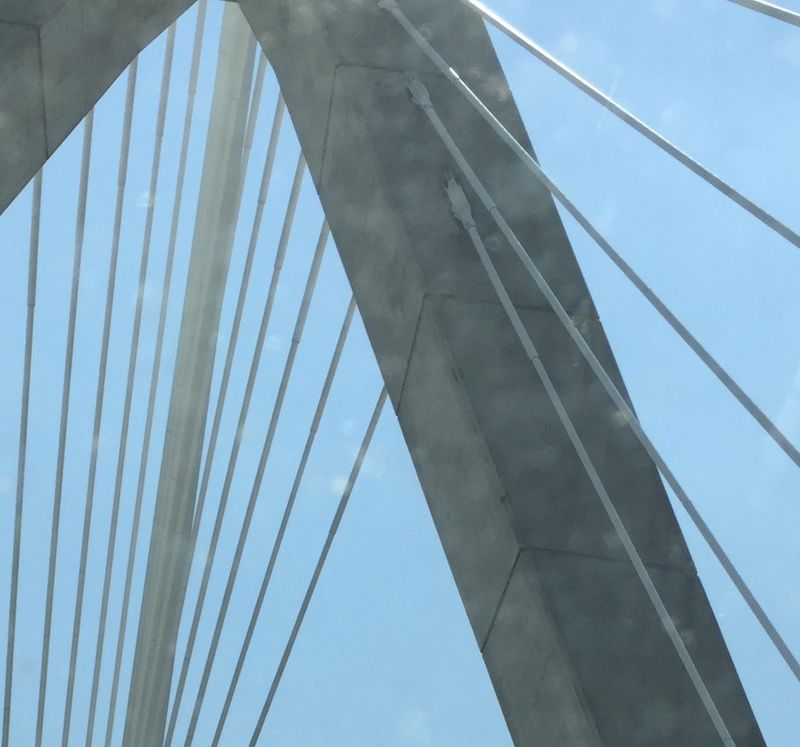 I was in the passenger seat, so it was another chance to photograph that beautiful bridge. I was frustrated because there was too much traffic to get a good shot. And then I decided to make the traffic part of the composition. (You can't wait for things to be perfect.) Tonight I cropped the original photo just a bit to get this composition. Here is a photo of my codfish project, "Bela Bacalhau," with her new owner. I haven't seen Bela since I dropped her off in mid-May to be auctioned for the benefit of the Marblehead Festival of the Arts. 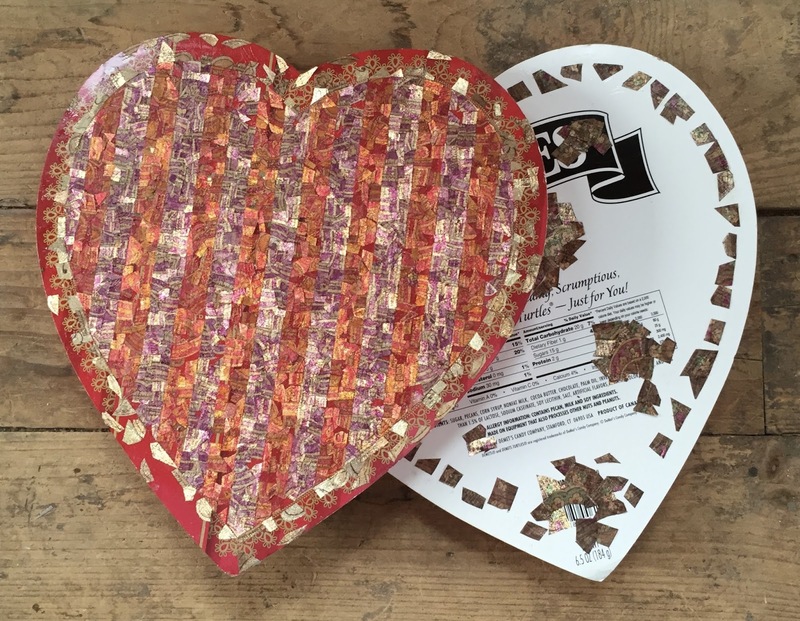 (Some 50 area artists decorated codfish cutouts which were displayed in Marblehead and then auctioned.) This was an on-line auction, with bids received from anywhere. Although I could see online that bids were being placed, I couldn't tell who was bidding, and although I knew Bela had been purchased, the buyer's identity was a mystery. But a few days ago, this picture turned up on my Facebook feed. There was "Bela Bacalhau" with her new owner! And the new owner turned out to be my daughter's college friend. 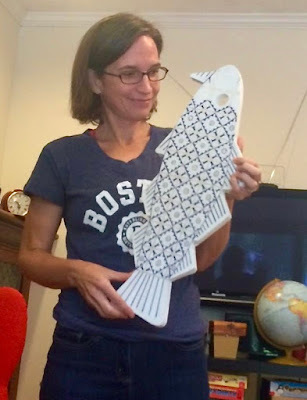 In fact, this spring she came up to Boston from Georgia to visit my daughter, and when she stopped by my house, saw my codfish as a work-in-progress. I had no idea she was bidding on Bela, so this was a surprise, and it put a great big smile on my face. 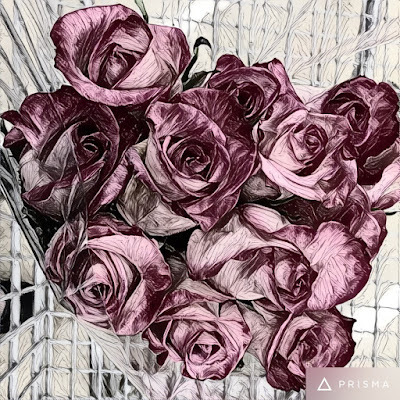 This past week, I used my new Prisma app to apply a filter to a photo that I had taken, of roses in a grocery cart. 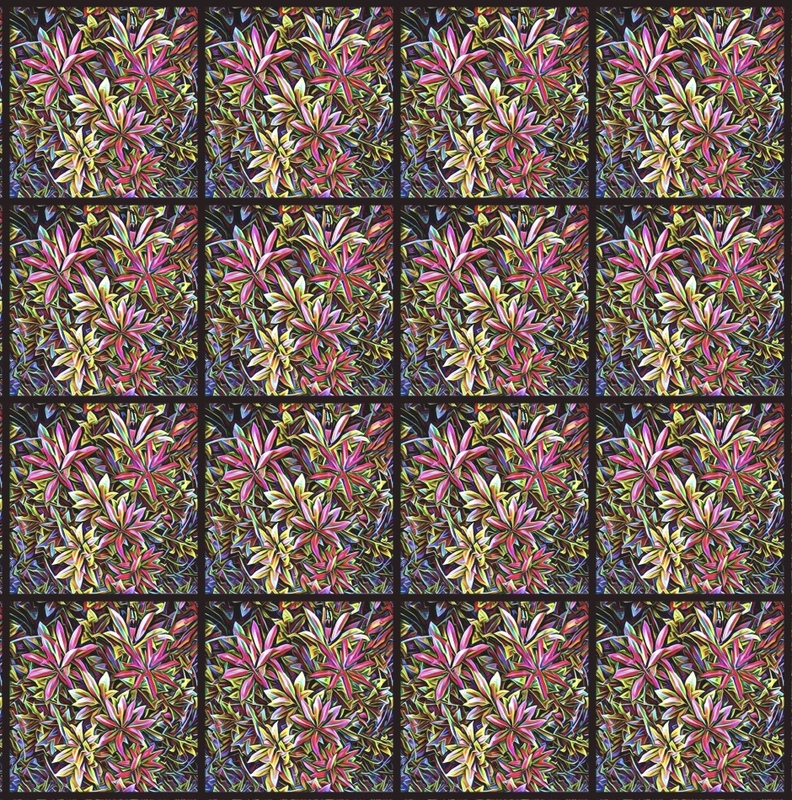 I have been thinking about making it into a pattern. Yesterday I did the prep work to get the image ready, and posted it here. 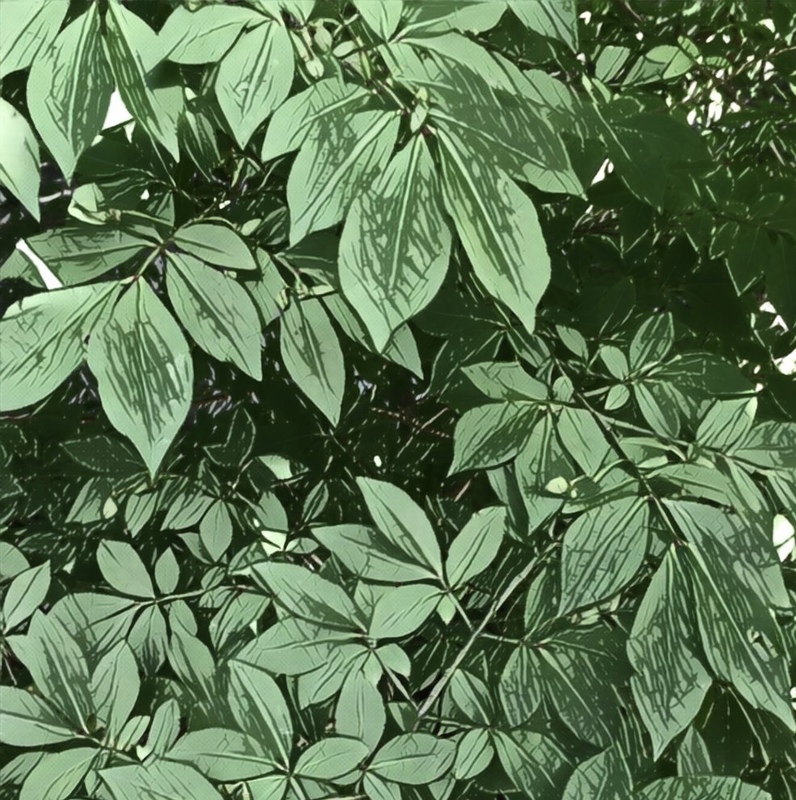 Then I used Painter to create a pattern from the image, and here it is. 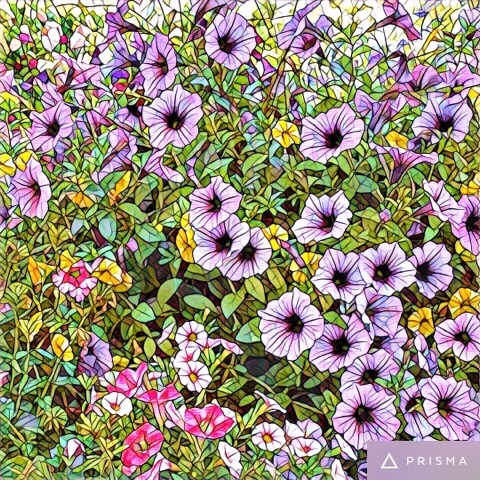 Last week, I posted a version of this image that I made with my new Prisma app. (The original photo was a picture that I took of some roses in my grocery cart, back in June.) 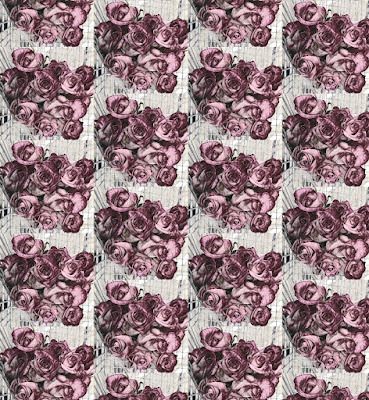 I have been thinking of making this image into a pattern, so tonight I did the prep work. I used Painter to do a little cropping, digital pastel, and cut-and-paste on one of the roses. Then I made the pattern, which I plan to post here tomorrow. Here's another experiment with my new Prisma app. This afternoon, I took a photo of some foliage and then applied the Heisenberg effect with Prisma. (I am a fan of Breaking Bad, and I think I was attracted to that filter because it is identified by a picture of Heisenberg in the black hat.) Anyway, the Heisenberg filter creates a black and white image that looks like a sketch, but I reduced the amount of the effect until the green of the original photo began to reappear. 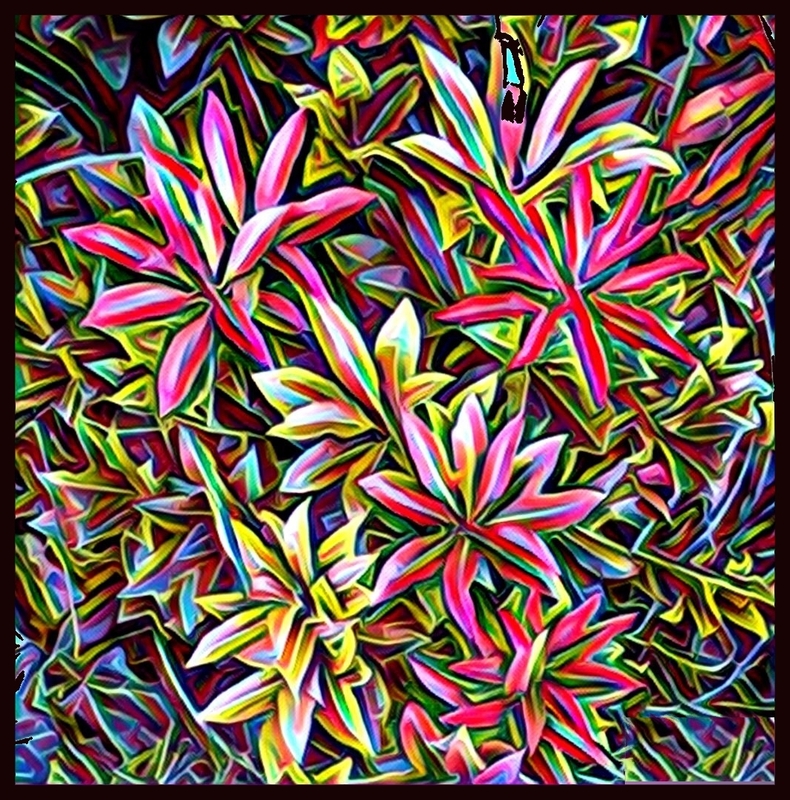 Recently I used my new Prisma app to create an image of "Electric Flowers" from one of my photos of some shrubbery. 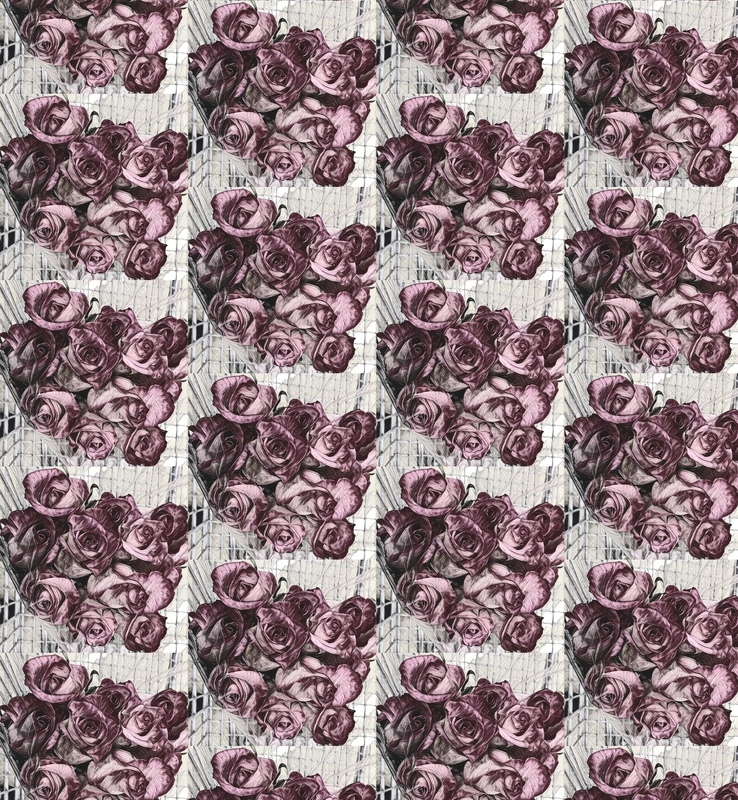 Yesterday I edited it in Painter and turned it into a pattern, and here it is. 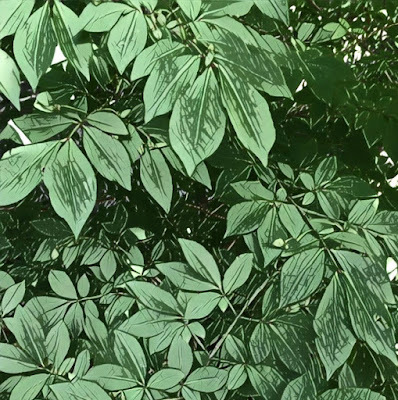 A few days ago, I got the Prisma app for my iPhone, and I made a version of this image from one of my photos of some shrubbery. I have been thinking about making this into a pattern, so tonight I got started. I did some basic editing and cropped the original image to get this composition. I opened the image in Painter and did a trial run, but decided that I needed to add a border. So I added 20 pixels to all sides and filled the border with black. 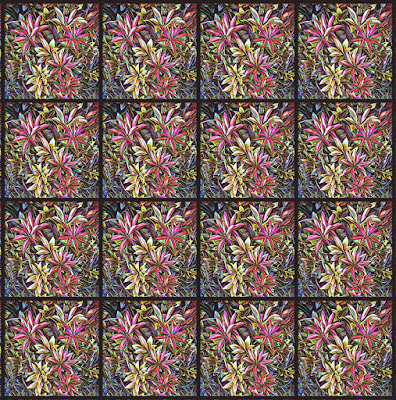 Then I tried again to make a pattern, and it worked much better. I plan to post it here tomorrow. 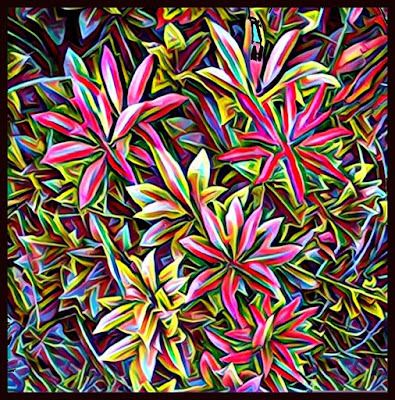 Another experiment with my new Prisma app. I used a photo that has been in my phone for weeks. I cropped it and applied the mosaic effect. This is my second experiment with my new Prisma app. I found a photo that has been in my phone for over a month, of roses in my grocery cart. I cropped it and then opened it in Prisma. I found an effect that looks like a black and white sketch and applied it. Then I discovered that you can control the amount of the effect applied, so I reduced the percentage of the filter, preserving some of the color of the original photo.